This 19 inch carpet bonnet is great for scrubbing those highly soiled carpeted areas with a floor buffer. 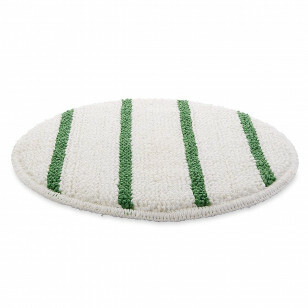 The green stripes provide agitation to lift deeply embedded dirt and grime from the roots of the carpet fibers. Each pad fits directly onto the pad driver that attaches to the bottom of a 20 inch floor scrubbing machine. The pads themeselves should be used with a lot of water and be completely soaked. For use on both sides and can be laundered repeatedly. Please feel free to take a at our full selection of floor buffing carpet bonnets for other options.